Manure spills happen for a range of reasons—a manure spreader rolls over, a hose breaks, a storage pond overflows after a relentless downpour. Whatever the cause, these events are such a threat to the environment that states have emergency teams to deal with the hazard. Typically, the responders build dams to contain the spill and then pump out the contaminated water. Although cleanup efforts start as quickly as possible, a fish kill in a nearby stream is often the first evidence that a spill has taken place. Another problem is that sediments in the contaminated water channel can capture phosphorus from the manure and release the nutrient back into the water—sometimes for months on end—at levels exceeding U.S. Environmental Protection Agency (EPA) criteria. But there were few details available about the links between manure spills and phosphorus until Agricultural Research Service soil scientist Doug Smith and doctoral candidate Shalamar Armstrong began to study the issue. 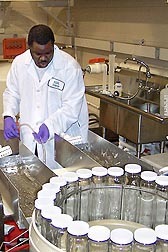 Smith, who works at the ARS National Soil Erosion Research Laboratory in West Lafayette, Indiana, was Armstrong’s technical advisor throughout the study. ARS soil scientist Chi-hua Huang, also in West Lafayette, and soil scientist April Leytem, who works at the ARS Northwest Irrigation and Soils Research Laboratory in Kimberly, Idaho, were also part of the team. Armstrong collected sediments from two drainage ditches in the Cedar Creek subwatershed of the St. Joseph River Watershed in northeast Indiana. The land surrounding each ditch was primarily used for row cropping. Soil scientist Doug Smith prepares a sample for nutrient analysis. Three sampling locations were selected so that the study would include sediments from drainage areas that ranged from 768 acres to 10,625 acres. This methodology also ensured that the scientists would be able to assess the effects of different particle size distributions and physiochemical properties on phosphorus absorption. The West Lafayette team added the sediments to an artificial water channel called a “fluvarium” and used swine manure minimally diluted with water to create their own worst-case manure “spill.” Then, after 24 hours, they cleaned it up using standard operating protocols for remediating contaminated spill sites. The researchers found the spill simulation initially resulted in an average water column dissolved phosphorus concentration of 5.57 milligrams per liter. The concentrations dropped to between 0.19 and 0.21 milligrams per liter 24 hours later, but they still exceeded EPA standards for rivers, streams, and drainage ditches in the Cedar Creek subwatershed. Soil scientist Doug Smith and technician Katelin Fisher collect water and sediment samples to evaluate the nutrient concentrations in them. The scientists also documented that after the spill, the channel sediments were able to capture significant amounts of phosphorus from the water, with adsorption rates ranging from 8.9 to 16.7 milligrams per square meter of sediment per hour. The finest clay loam sediments from the upstream channel sites adsorbed the greatest levels. However, after the simulated spill cleanup, all the sediments released phosphorus back into the water at rates that caused the phosphorus level in the ditch water to exceed EPA’s maximum level by at least 67 percent. Even though the fine-textured clay loam sediments adsorbed the highest levels of phosphorus, the course-textured sandy sediments from the largest drainage areas released the most phosphorus back into the water after cleanup was complete. “These results strongly suggested that the current approaches to remediating manure spills need improvement,” Smith says. Shalamar Armstrong collects drainage ditch sediment that will be used in laboratory testing of worst-case manure spill scenarios. Fortunately, the team had some ideas about where to start looking for improvements. Earlier studies showed that adding alum to poultry litter, swine manure, and other agricultural byproducts substantially mitigates phosphorus release. So they ran a series of tests to see how well alum amendments could stop, or at least slow, the release of phosphorus deposited in channel sediments after manure spills. The researchers added different levels of an alum-calcium carbonate mix to the same sediments they tested in the first study. The calcium carbonate was included to prevent the acidic alum from significantly increasing the water’s acidity. They observed that amending the contaminated sediments with 1.6 milligrams of alum-calcium carbonate per gram of sediment suppressed phosphorus release by 92 percent in sandy sediments and by 72 percent in clay loam and loamy sand sediments. Higher amendment levels suppressed phosphorus release in all three soil types by up to 100 percent. In general, greater rates of alum were needed to suppress phosphorus release from the clay loam sediments than from either the loamy sand or the sandy sediments. On average, clay loam sediments required 54 percent more alum to mitigate the release of phosphorus than sediments containing at least 60 percent sand. Adding calcium carbonate to the alum did not completely protect the water column from increased acidification. But water flowing over sediments amended with the alum-calcium carbonate mix was less acidic than water flowing over sediments amended solely with alum. Data from the study was used to develop models to predict the rate of alum application that would be needed to mitigate phosphorus release from contaminated sediments, based on sediment properties. “Our results demonstrated that alum can help sediments retain phosphorus after a manure spill,” says Armstrong, who is now an assistant professor at Illinois State University. “We think it has potential for enhancing current manure spill remediation methods.” Findings from both studies were published in the Journal of Environmental Quality in 2009 and the Journal of Environmental Monitoring in 2012. “These are the first studies that have examined in detail how manure spills affect in-stream phosphorus fate,” adds Smith. “Farmers are focusing on finding ways to contain phosphorus loss from their farms, and this information could help.”—By Ann Perry, Agricultural Research Service Information Staff. To reach scientists mentioned in this story, contact Ann Perry, USDA-ARS Information Staff, 5601 Sunnyside Ave., Beltsville, MD 20705-5129; (301) 504-1628. "Measuring and Managing Impacts of Manure Spills" was published in the March 2013 issue of Agricultural Research magazine.